For those who like ‘em fast & built to last…Bunny fits the description. She’s a sturdy built mare with incredible bone and the best black feet. 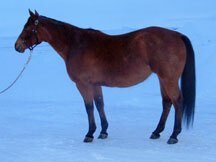 Bunny is by the Great Race Horse sire Dash To Chivato ~ Stakes winner of over $150,000. She’s out of a mare called West Coast Bunny who had 8 wins & $25,664 in earnings at the track. West Coast Bunny is an own daughter of Sail On Bunny SI 108, AAAT 10-6-3-1,$908,982 Won Kindergarten Fut., Dash For Cash Fut., West Texas Fut.,& others. Sail On Bunny/ Bunny Bid often shows up in the pedigree of winning barrel horses including Stephanie Fryars NFR mare Salena, Tara Bynum’s horse Cadillacs N Karats and many others.